There is no set level for this exercise. Project work is an excellent way to begin looking at this technique, as students will have exposure to a number of texts, videos and materials over a longer period of time. One way of creating background to a project is setting up a webquest. This is what I want to help you to do here. This lesson plan aims to provide you with something to include in your teaching repertoire, but also to introduce you to a useful Web 2.0 application – if you were not already aware; Thinglink is a free online application that allows the user to create interactive images – including links to web pages, YouTube videos, etc. For the sake of simplicity, I’m going to imagine that you’re going to do this spanning two classes, with the reading and researching taking place in one class – and the presentation of information taking place in another class. Stage one – The prep. 1. Find a relevant article online. You could use Wikipedia, the BBC, Wikinews, etc. Choose something that you think your students can deal with, but don’t make it too easy. Remember, you can grade the questions to the appropriate level. I’m using Wikinews for this particular quest. 2. You need to take a screen grab of the text you want your students to read. The way I’ve done this is to press the PrtSc (print screen) button on the keyboard, and pasted the contents into MSPaint – at which point I cropped out all the irrelevant parts. We’re not talking high-tech here. You could of course also use a more advanced program like Snagit, or something similar, but who wants to pay for a program, when you can do it yourself for free? 3. Then it’s as simple as saving the image on to your hard drive. 4. Log into Thinglink.com – you can do this through your Google/Twitter/Facebook account. It’s free. 6. Upload the image you just saved. 7. Now you will have the option to tag your image. And this is where the questions come in. Find points of interest in the article, and come up with a variety of well-graded questions. Once you have done so, you’ll have to find the answers yourself. Write your questions or instructions in the text space, and include a link to where the students can find the information in the link space. My advice here is to make sure that the information isn’t too deeply buried in the websites you link to, or students will find they are wasting a lot of time. 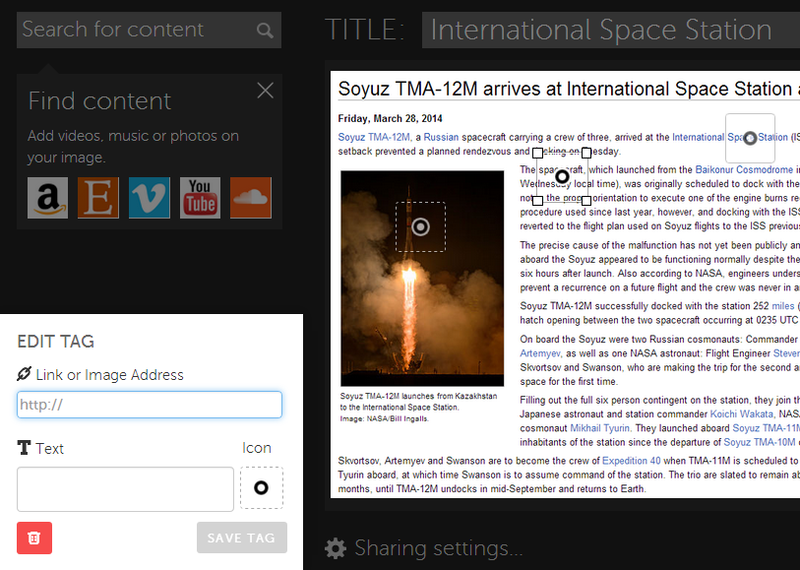 The tag option looks like this: Notice that you are able to add interactive content. If you want your tags to link to an external source you can add the URL (http;//). You can also embed video or audio content from youtube, vimeo, soundcloud and others. All you need to do is add the relevant content to the link or image address field. In order to maintain interest, and keep students challenged, it’s important to direct them to a number of information sources – include multimedia options so that you may test all their comprehension skills. Giving students the chance to watch videos, listen to audio, and find images also increases their exposure to the language. I’ just an image, click me to go to the website. 8. 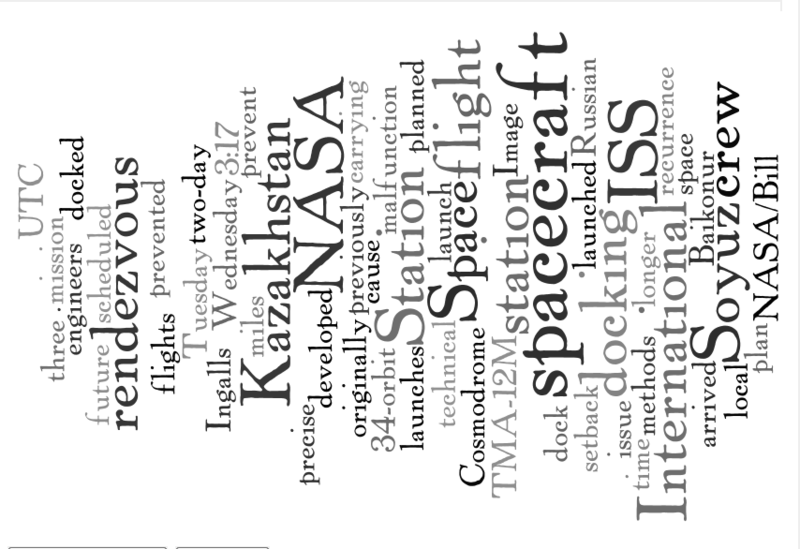 As part of this preparation, also create a word cloud with a selection of key vocabulary from the article. For the purposes of this I’m using wordle.net – although there are others you might prefer. You’ll notice that the article I have chosen here is for an advanced group. Now, this all depends on your classroom set up. If you have no access to computers, you’ll have to set the webquest itself as homework. Set up the reading exercise with a prediction activity. Put students into small groups, and distribute the word cloud (or project it on the egg-shell white walls of your Utopian paper-free renewable classroom). Have students note down any unusual words, or any words they are unfamiliar with. After they have done so, have students discuss what the article is about in their groups. Have each group share their ideas, and give justify their reasoning, after about three minutes. An example word cloud for an advanced reading. Next set the students to work by providing them with the article itself. Have students skim read for two minutes. Then ask students if their predictions were close to the truth, and if they were not, how their ideas differed from the original article. If possible, do this online, rather than using paper. Go over tricky vocabulary. In this example, the original article can be found here Have students answer around ten reading for gist and detail questions. It is essential that you grade the questions to suit the level of the group. Depending on the text you choose, you may also wish to include a glossary of the more difficult terms. Explain to students that they are going to do a webquest. Once the furore and excitment has died down (ahem), provide students with a link to your Thinklink image. For example: International Space Station. Tell the students that they must find out some information. The image they can see has several circle-markers on it. If they hover the mouse over these circles then can read the questions. If they click the circles, they will be taken to other websites, where they can find the answers to their questions. Alternatively, they might be given a video or listening track which will provide them with answers. Make sure that each student is clear that they must find out the information on their own/in their groups. They should divide up the work between themselves – and bring it all together at the end of the allotted time. As you are encouraging autonomous learning, have students direct themselves at this point – though make sure you are on hand to prevent any secret Facebook perusal. Have students prepare their information in the form of a presentation. Each group should be given time to share what they have found out with the rest of the class. Once students have finished, highlight that they have been able to find out the information themselves – using authentic resources. Please note that you should carefully vet any websites you send your students to and ensure that the questions are graded appropriately. Another example thinglink: The image below is a link to Thinglink. I have created questions which can be seen by hovering the mouse over the round circles. If the Student clicks he or she will be taken to an external link. This webquest will give students some background in mountaineering. but it will also show you how easy it is to create your own narrow reading exercises – perfect for encouraging learner autonomy. Screen shot of article taken from the hugely useful Wikinews.org Can you think of any other applications for this tool? I’ll be posting more ideas soon. I hope that was useful and clear.